Our First Grade Curriculum Overview contains all my notes on teaching first grade (138 pages). Many books and resources are included! As helpful as these notes are, however, I realize that many homeschool families are on a strict budget, and may feel overwhelmed at the number of books it seems they need to buy. Please don't get discouraged. You don't have to spend a fortune to do a good job teaching your child. Here are 12 books which, combined with the books from the Kindergarten Dozen, will give you all the essentials you need to teach first grade. Many of them also will give you guidance in future years. Bear in mind that these booklists assume several things; first, that you have purchased the books mentioned on the list from the previous grade level, and second, that you have access to a free public library to augment your curriculum planning. For example, no collection of Grimm's fairy tales is included in the Kindergarten Dozen. This is something you can find at your local library. No books on learning to knit are included in the First Grade Dozen for the same reason. There are also many free resources online, such as the books by Rudolf Steiner listed below. Use all the free resources available to you to help keep costs down! Art & craft supplies and other school materials such as a recorder are not included in these lists. I recommend if you are preparing for the next year over the summer, that you buy 4 books each month (Jun/Jul/Aug). If you don't have the Kindy Dozen, this will be 8 books. Please note: Prices were at the time of writing & are subject to change. Find more articles listed on my website under "First Grade". L M N O P Alphabet Wall Cards -- Poems by Howard Schrager. Illustrated by Bruce Bischof. 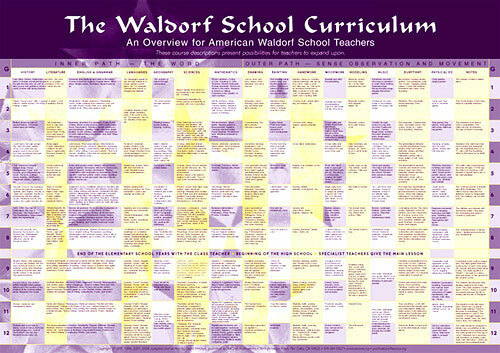 You can find many of these books used through Yahoo groups such as waldorfcurriculum-supplies. The original Waldorf teacher training was brief: it lasted only two weeks. It was understood by those who attended, however, that Waldorf education was to be based upon the continuing training or self-education of the teacher, and that this was only the beginning of that process. His approach is tailored to the spiritual and physical needs of the children themselves, not to an arbitrary curriculum. (Some feel, especially Alan Whitehead of Spiritual Syllabus that a homeschool education actually comes closer to what Steiner had intended than even the best Waldorf school! Read his book A Steiner Homeschool? for more). At 9:00 AM he gave the course now translated as The Foundations of Human Experience (formerly The Study of Man); at 11:00 AM, Practical Advice to Teachers ; and then, after lunch, from 3:00 PM to 6:00 PM, he held the informal discussions published in Discussions with Teachers . If you wish to embark upon the same path of teacher training as the first Waldorf teachers, you cannot do better than to read these three books.